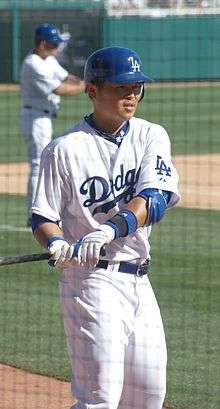 Chin-lung Hu (Chinese: 胡金龍; pinyin: Hú Jīnlóng; Pe̍h-ōe-jī: Hô͘ Kim-liông; born February 2, 1984) is a Taiwanese professional baseball player, currently with the Fubon Guardians of the Chinese Professional Baseball League. He is the fifth player — and first infielder — from Taiwan to play Major League Baseball. His last name (along with that of fellow countryman Fu-Te Ni, formerly of the Detroit Tigers) is the shortest in MLB history. Hu recorded 34 hits in his MLB career, more than any other Taiwanese-born player. Hu was signed by the Dodgers on January 31, 2003, and began his professional career with the rookie league Ogden Raptors in 2003. He split 2004 between the Columbus Catfish in A ball and the Vero Beach Dodgers in High-A ball. In 2005, he played the whole season at Vero Beach and hit .313 with 23 stolen bases. In 2006, he played for the Double-A Jacksonville Suns. Hu played in the All-Star Futures Game during the All-Star break in both 2006 and 2007. He won the MVP award for his performance in the 2007 game. He was promoted to Triple-A Las Vegas on July 12, 2007, and made his major league debut on September 1, 2007, against the San Diego Padres. In his second MLB at bat, Hu hit a solo home run on September 11, 2007, against the Padres, becoming the first position player born in Taiwan to hit a home run in MLB. (Hu's teammate, pitcher Hong-Chih Kuo, had become the first Taiwanese-born player to hit a home run in MLB earlier in 2007). On September 25, Hu hit a two-run homer and became the first Taiwanese-born player to hit two home runs. Hu spent most of 2009 in AAA with the Albuquerque Isotopes and appeared in only five games with the Dodgers after a September callup. In 2010 he again spent most of the year with the Isotopes. He appeared in 14 games with the Dodgers in 2010 and got 3 hits in 23 at-bats. Hu with the New York Mets. 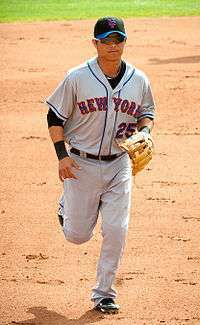 On December 27, 2010, he was traded to the New York Mets in exchange for pitcher Michael Antonini. On May 17, he was outrighted to the minor leagues. After playing for the Adelaide Bite of the Australian Baseball League and starting shortstop for the World All-Stars at the 2011 Australian Baseball League All-Star Game, Hu signed a minor league contract with the Cleveland Indians in January, 2012. He was released on March 28, 2012 and signed to a minor league deal with the Philadelphia Phillies, however his contract was voided the next day after he failed a physical. He then signed with the Southern Maryland Blue Crabs for the 2012 season. In 2013, he signed with EDA Rhinos of the Chinese Professional Baseball League. 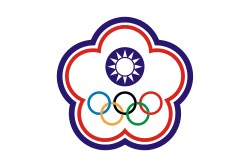 Hu played for Chinese Taipei in the 2006 World Baseball Classic. ↑ Singer, Tom (June 8, 2007). "Dodgers prospect named Futures MVP". MLB.com. Archived from the original on July 12, 2007. ↑ "Dodgers part ways with Chin-Lung Hu". ESPN.com. December 27, 2010. Archived from the original on December 30, 2010. Retrieved June 21, 2014. ↑ Paul Hoynes (January 13, 2012). "Cleveland Indians GM Chris Antonetti works on making that first decision". Archived from the original on January 31, 2012. Retrieved January 30, 2012. ↑ "MLB's Hu Chin-lung to join minor league team". The China Post. China News Analysis. April 4, 2012. Archived from the original on April 21, 2014. Retrieved April 4, 2012. Wikimedia Commons has media related to Chin-lung Hu.